Many historical documents and photographs from the Clifford family were sold at auction in the south-west of England between 1990 and 2005. If you have any material relating to Henry Clifford, or know where it may be found, please email me: billb@ftldesign.com. Drawings, watercolours and paintings signed H. Clifford are also of interest. A small section of the 1866 Atlantic Cable, which has remained in the Clifford family for 144 years, is featured on BBC Radio 4's A History of the World website. Henry Clifford as a youth. 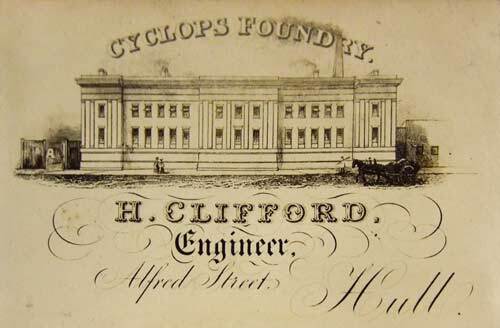 Henry Clifford (1821-1905) started his career as a mechanical engineer. Clifford, the cousin of Sir Charles Bright’s wife, is mentioned numerous times in the two-volume biography of Bright written by Bright’s brother and son and published in 1898. At the time the book was published Clifford had recently retired from a long and productive career in the cable industry. 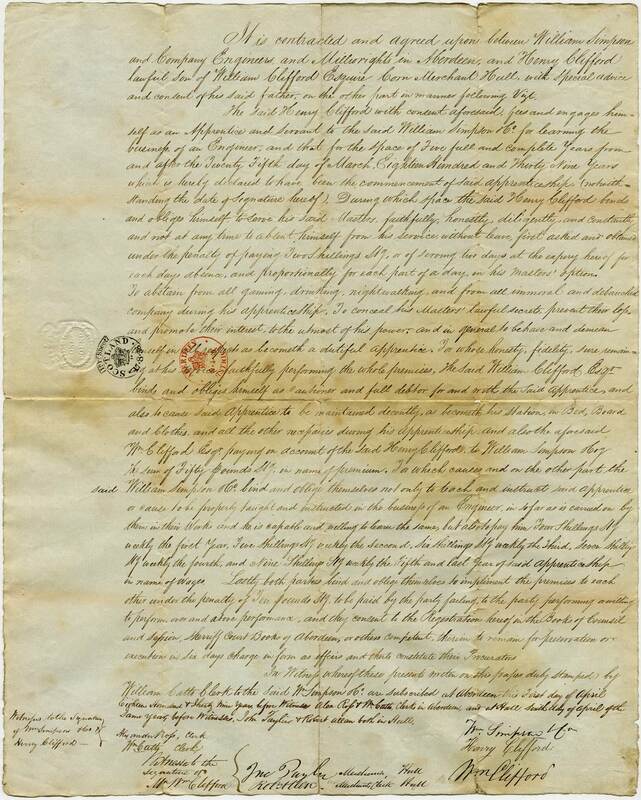 He had early ambitions to be an artist, but under family pressure, in 1838 at age 16 he was apprenticed to William Simpson & Company Engineers and Millwrights of Aberdeen “for learning the business of an Engineer,” the five year indenture running from 25 March 1839 to 25 March 1844. Henry’s father William Clifford paid Simpson a £50 premium for the apprenticeship, and along with his training Henry was entitled to receive “Bed Board and Clothes” as well as an allowance of four shillings per week the first year rising to nine shillings in the fifth year. The 1841 Scottish census shows Henry Clifford at age 19 living in Aberdeen with the occupation of engineering apprentice. Clifford then considered emigrating but did not pursue this course. In 1851 he applied for the post of Superintending Engineer at the Waterman Steam Packet Company, but despite an impressive array of testimonials he failed win this position. The 1851 English census shows that Henry, now aged 29, had moved to London, and gives his profession as “Engineer.” He was residing, presumably as a lodger, at 2 Windsor Terrace, Finsbury, the house of Caleb Pizzie and his family. Pizzie was a commission agent and carpet manufacturer with premises nearby. Windsor Terrace was just off City Road, around the corner from St Luke’s Workhouse, so it was perhaps not the best of areas at that time. [2a, b]. “Windsor Terrace, City Road” is the location of Mr Micawber’s house in Charles Dickens’ David Copperfield, published in 1850. Copperfield becomes Micawber’s lodger, and is taken to: “... his house in Windsor Terrace (which I noticed was shabby like himself, but also, like himself, made all the show it could)...”. Micawber is a commission agent for Copperfield’s employer, but soon falls into bankruptcy and goes to debtors’ prison, and Copperfield has to move. This episode in David Copperfield was taken directly from Dickens’ own childhood experiences in the 1820s. Falling into reduced circumstances, his family lived for a time in a shabby home in Bayham Street, Camden Town, just a couple of miles from Windsor Terrace, and his father was eventually sent to debtors’ prison. Like Mr Micawber, Henry Clifford’s landlord, Caleb Pizzie, had been declared insolvent (in 1847, when he too was a commission agent), and was perhaps reduced to taking in a lodger to help make ends meet. He was bankrupt again in 1854, when he was in the Debtors Prison for London and Middlesex and his estates and effects were assigned to his creditor. The area has been re-developed but Windsor Terrace remains, now intersecting Micawber Street at its north end. Clifford had met Charles Bright before the occasion of Bright’s marriage in the summer of 1853. Bright had known his future wife, Hannah Taylor, for several years before his marriage; she is described in the biography as “Miss Taylor, daughter of John Taylor of Bellevue, Kingston-upon-Hull.” Henry Clifford was born in Hull, and, as noted below, was a cousin of the Taylors. 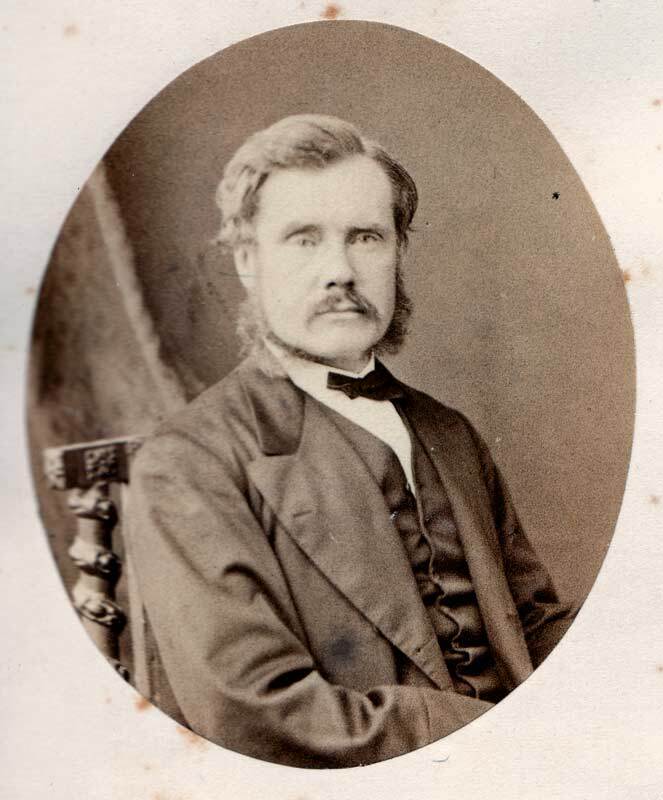 Henry Clifford was introduced to the Atlantic cable project in late 1856 through his connection with Charles Bright, and served as an engineer on all five of the early Atlantic cable expeditions, from 1857 to 1866. This is the first published mention of Clifford’s artistic talent. As a engineer he was would have been skilled in mechanical drawing, but he was also a good artist in watercolours and oils, taking the opportunity of quiet times during cable voyages to make drawings of the ships and the scenery. Some of his drawings were used as the basis for woodcuts in the Illustrated London News in 1858, and a number of his paintings are reproduced in Sir Charles Bright’s biography and in Charles Bright’s 1898 book, Submarine Telegraphs. More information on Clifford’s art appears below. 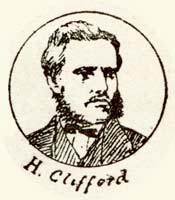 Clifford was also involved with the preparations for, and sailed on, the two expeditions of 1858. During the progress of the work in 1857 the attention of the Board had been directed to the mechanical talent and experience of Mr. W. E. Everett, the chief engineer of the United States’ ship Niagara, and they now resolved to consult him with reference to the alterations and improvements required in the future paying-out machinery. They, therefore, nominated a Committee, consisting of Mr. Penn of Greenwich, Mr. Field of the firm of Maudslay, Son, and Field, and Mr. Lloyd the chief of the Steam Department of Her Majesty’s Navy, to act with Mr. Everett, and at once to proceed to Plymouth to examine the machinery and mechanical appliances in use by the Company, and to report thereon to the Board. Upon this report the Directors determined to act, and as the consent of the United States’ Government was necessary, prior to Mr. Everett’s being able to devote his attention to the Company’s service, an application to the Government at Washington was made by the Directors to allow Mr. Everett to return to England early in 1858, for the purpose of superintending and carrying out the manufacture of machinery in the form suggested by himself and the Committee. 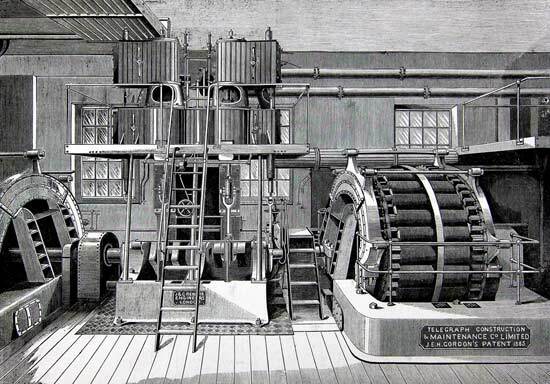 Everett spent about three months working at the premises of Easton & Amos, who were manufacturing the paying-out machinery, and in April 1858 invited his colleagues to inspect the work. GEORGE SAWARD, ESQ., SEC. of ATLANTIC TELEGRAPH Co. The first expedition of 1858 left Plymouth on 10 June, but a few days into the voyage the fleet ran into a week of gales, during which it was feared that the shifting cable would breach the sides of the Agamemnon. 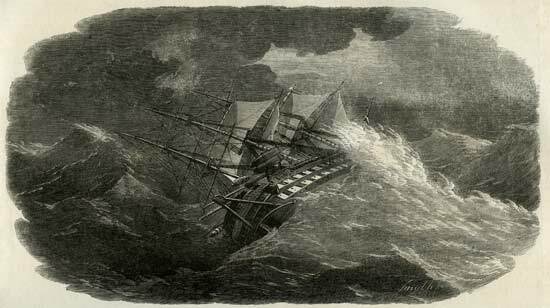 Clifford’s drawings of the ship in the storm were used as the basis for a series of woodcuts published in the Illustrated London News Supplement dated 31 July 1858. 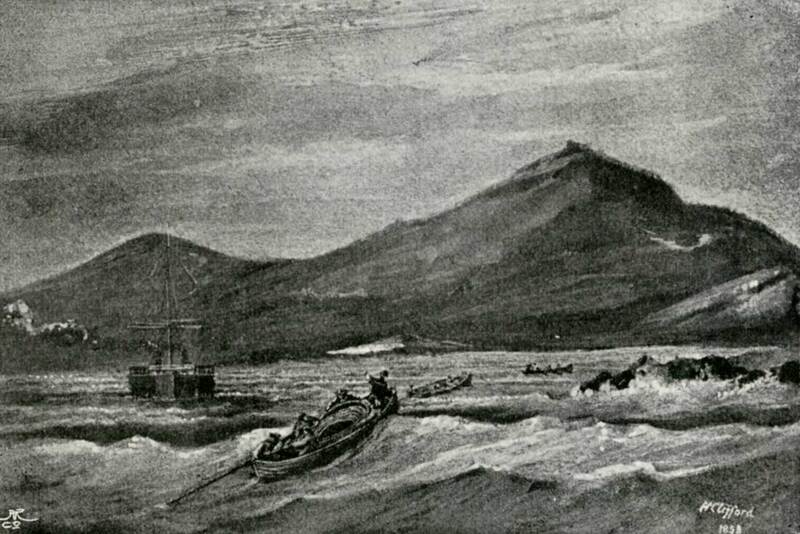 The cable fleet survived the storms, but the expedition had to be abandoned after the cable broke on 29 June. It’s interesting to compare the newspaper version of this scene (above), re-drawn from Clifford’s original by the ILN’s woodcut artists, with Clifford’s versions (below), reproduced from Bright  and an original painting still in the Clifford family. Accounts of the storm in books of the time report that the Agamemnon heeled over to 45 degrees in either direction, which Clifford has accurately reproduced in his paintings; the ILN evidently felt the need to exaggerate this for dramatic effect. The ILN published two more scenes from the storm based on Clifford’s artwork. 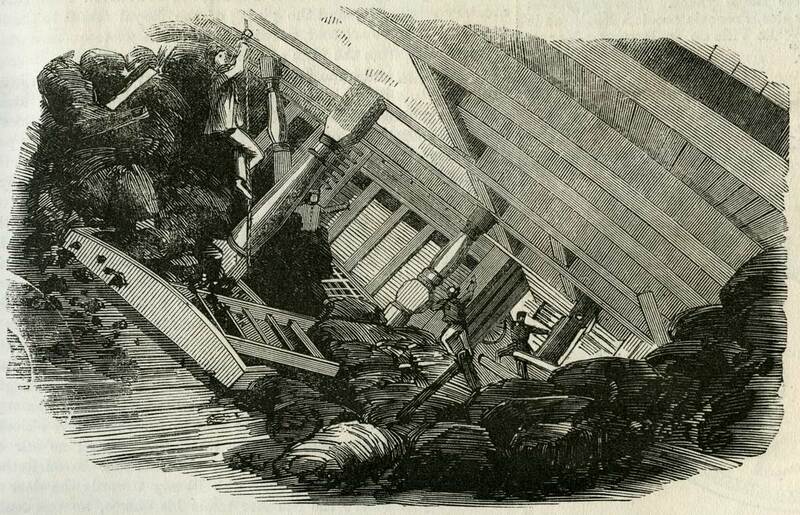 Again, the effect of the storm on the ship’s store of coals has been exaggerated from Clifford’s drawing, although it is of course possible that he sent a different sketch to the newspaper. Drawing by Henry Clifford, reproduced in Bright biography. Because of unforeseen technical problems, although the cable had been successfully landed and messages were sent in both directions over a period of several weeks, transmissions through the cable failed on 20 October 1858. 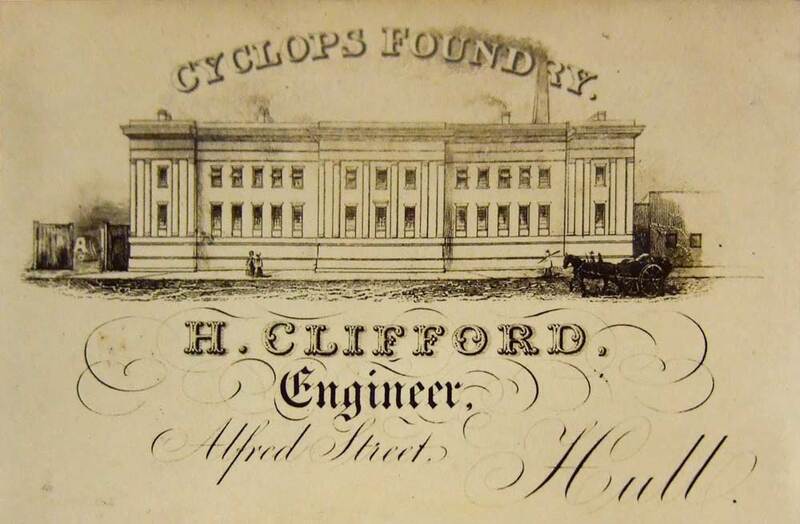 After the failure of the 1858 cable Clifford joined Glass Elliot & Company, one of the earliest cable manufacturers. One of his first projects for the company was the Cromer-Emden cable, made for the Submarine Telegraph Company. 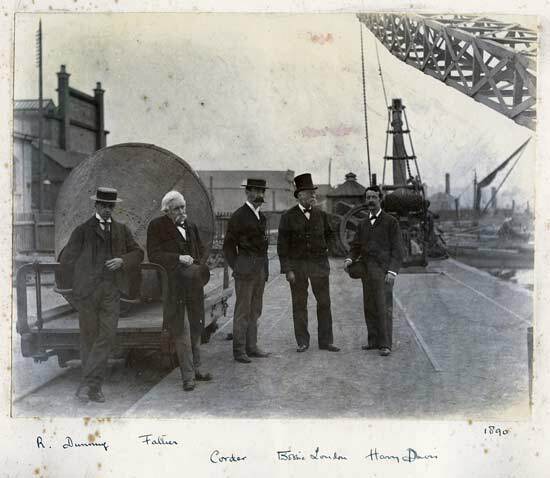 The cable was completed on 4 November 1858 by CS William Cory, with Clifford and Canning as engineers. 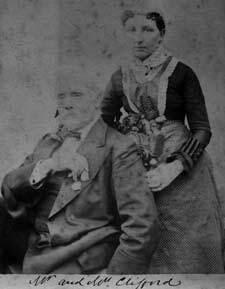 In late August 1859 Henry noted in a letter to his mother: "I wrote you a few lines yesterday stating that I expected to go to Malta and Sicily with the cable. 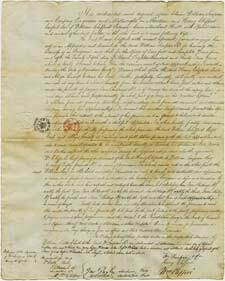 It is now decided that I do go, and I have no alternative but to take the duty with a good grace, though it is no little disappointment. " An unsigned watercolour [PAG9922] in the Henry Clifford collection of the National Maritime Museum is captioned: “Maritimo E.N.E. 10 miles off September 26th 1859”. Now known as Marettimo, this is the westernmost of three small islands off the coast of Sicily between Trapani and Marsala. 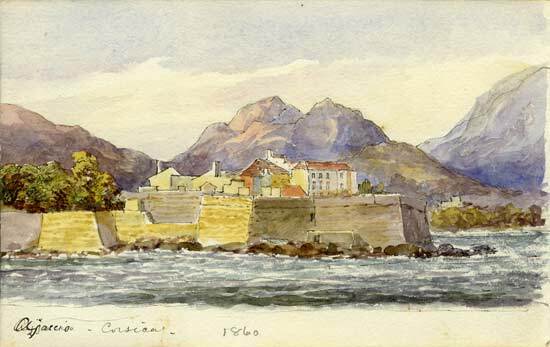 Henry presumably painted this watercolour on the Malta/Sicily cable voyage described in the letter to his mother. This cable was laid for the Mediterranean Extension Telegraph Co using CS Lady Seale. 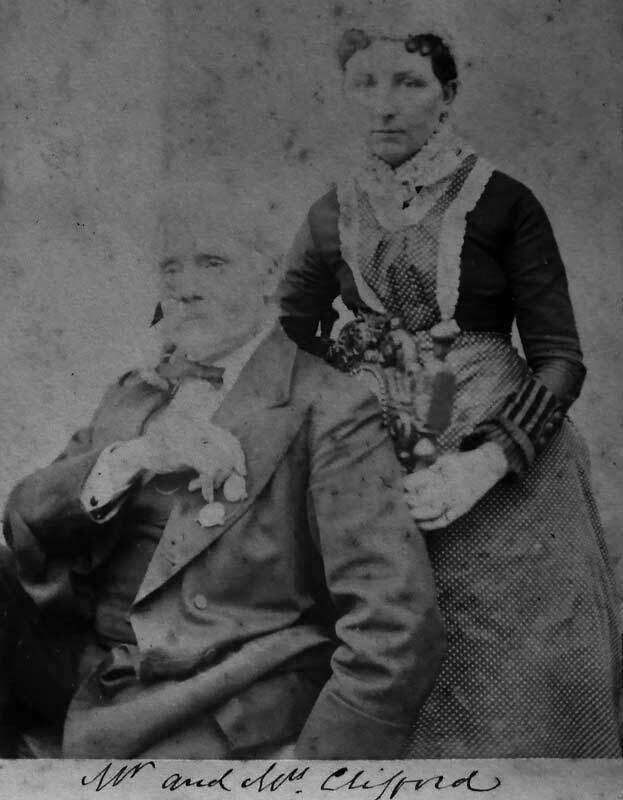 Also present in the Cliffords’ house on census day in 1861 were Thomas Alexander and Mary W. Alexander. Thomas’s occupation, at age 21, was shown on the census as “Assistant Telegraph Engineer”; it is likely that Henry secured a position for his brother-in-law through his connections in the cable industry. Thomas Alexander worked for Charles Bright’s company for a number of years. and the painting is almost certainly from 1861. 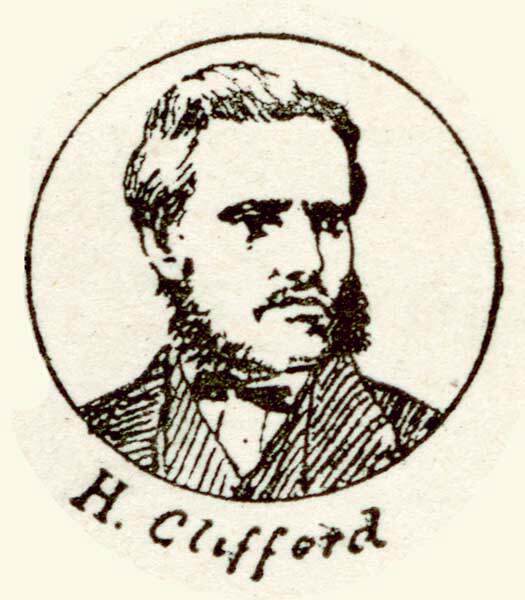 Later that year, in September 1861, Clifford continued the cable from Alexandria to Benghazi [Bright 1898 p64]. For more information see this page. 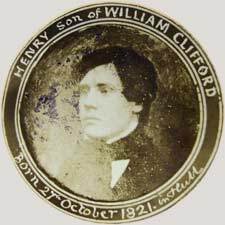 His second son, Henry Charles, was born on 10 September while Clifford was away laying the cable. While on this expedition he painted two watercolours of Libyan coastal scenery between Ras al Milhr and Benghazi. Both were made on 21 September 1861, one at 3pm “139.1 Nauts from Ras al Milhr”, and one at 4pm “145 Nauts”, according to the pencil captions on the back of each painting. laying cable between Malta & Alexandria. 3 P.M. Saturday Sept. 21st 1861. Following the line of the cable from Ras al Milhr (near present-day Bardiya) for 139.1 nautical miles (~258 kilometers) gives a location for the paintings somewhere near Derna, on the Libyan coast. About the same distance again would have brought the expedition to Benghazi. The Rangoon arrived at Benghazi on 23 September 1861, two days after the date of the watercolours, and from there returned to England. The Malacca completed the final section, from Tripoli to Benghazi, between 26 and 28 September, and communication between Malta and Alexandria was then established. In late July 1862 Canning and Clifford were engineers for the laying of the Lowestoft to Zandvoort (Holland) cable by CS Hawthorns. The cable was made and laid by Glass, Elliot for the Electric and International Telegraph Company. In 1864 Glass, Elliot merged with the Gutta Percha Company to form the Telegraph Construction and Maintenance Company Ltd. (Telcon). This merger formed a company whose main purpose was to make an attempt to lay the Atlantic cable in 1865 using the Great Eastern. The Great Eastern, under Captain Birch, sailed in July of 1864 from Liverpool to Sheerness, where she was to take on the cable for the 1865 expedition, then in course of being made by Telcon. 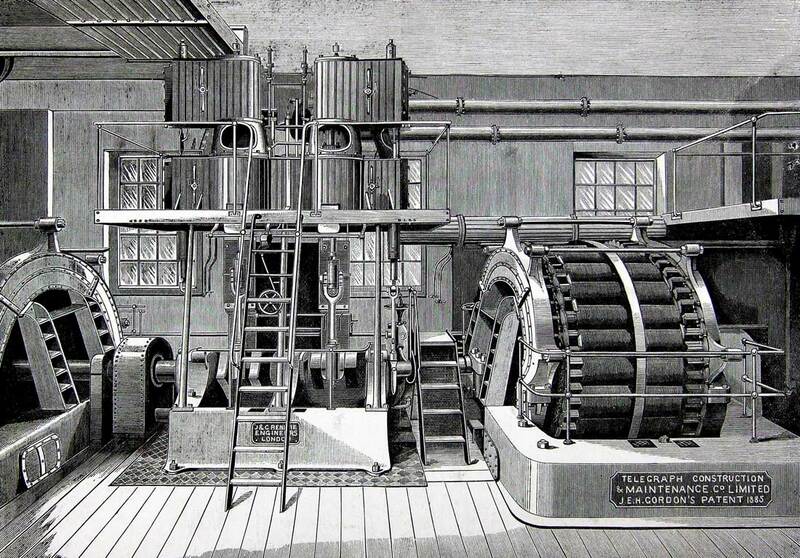 Daniel Gooch, Samuel Canning and Henry Clifford were on board “with a view of watching the working of the machinery” [The Telegraphic Journal, 16 July 1864 p. 35]. By December 1864 the ship was almost ready to load cable, the delivery of which was expected to begin in January 1865 [The Telegraphic Journal, 17 December 1864 p. 292]. The expedition set sail on 15 July 1865. Designed by Henry Clifford, the paying-out machinery used on the Great Eastern incorporated an automatic release mechanism and jockey wheels. 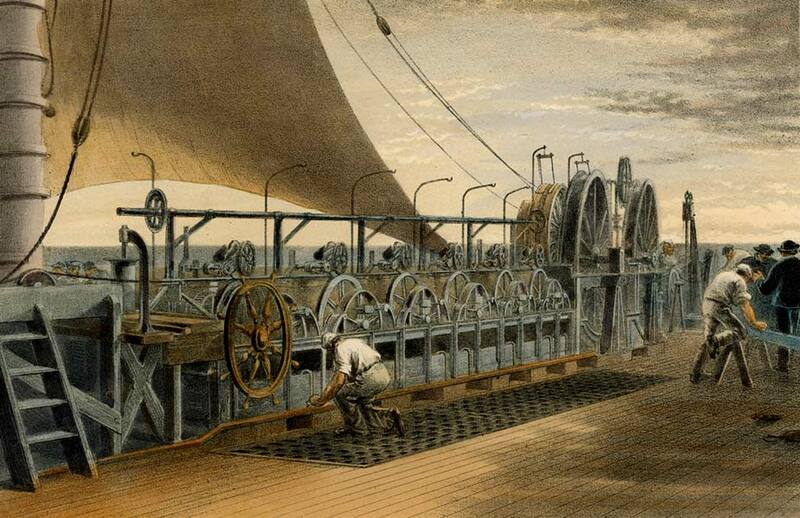 The machinery had been designed to keep the cable taut as it paid out over the Great Eastern’s stern. Samuel Canning, chief engineer of the Telegraph Construction and Maintenance Company (Telcon) was in charge of the laying with Mr. Clifford supervising the machinery. They were assisted by Messrs Temple and London plus eight engineers and mechanics. The cable laying staff was provided by Telcon. This beautiful and ingenious machinery has been invented by Messrs. Canning and Clifford, and has worked up to this time with admirable regularity and precision. At noon yesterday, 531.57 nautical miles had been paid out, between 1,529 to 1,950 fathoms. Distance from Valentia 476 miles. We asked the Terrible to prevent any ships from crossing the cable astern, and she replied, “Yes, if possible." But there is Mr. Canning hurrying along to the bow of the ship: he has never for a moment lost his self-possession. He soon returns midships and is accompanied by Mr. Clifford, his able assistant, and a staff of workmen. Practical conclusions unanimously arrived at by those engaged in various capacities in the expedition. "1st. That the steam-ship Great Eastern, from her size and consequent steadiness, together with the better control obtained over her by having both the paddles and screw, render it possible and safe to lay an Atlantic Telegraph, in any weather. 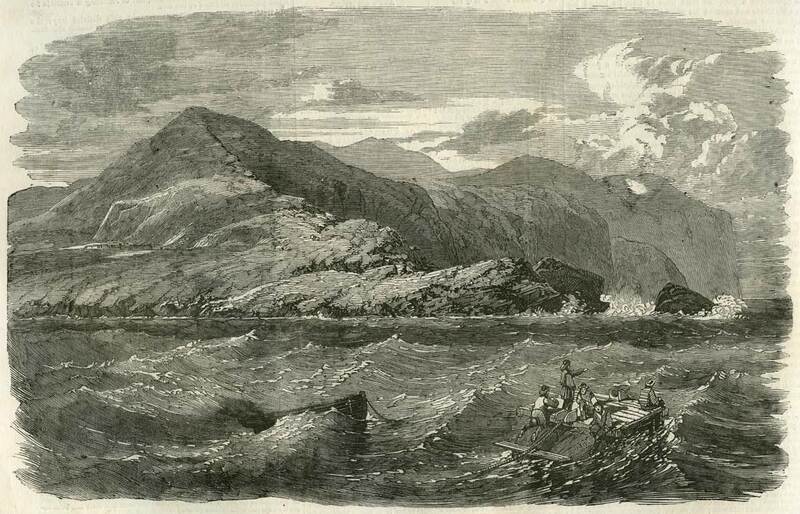 The 1865 expedition ended in failure when the cable broke and the end could not be recovered after many days of grappling. 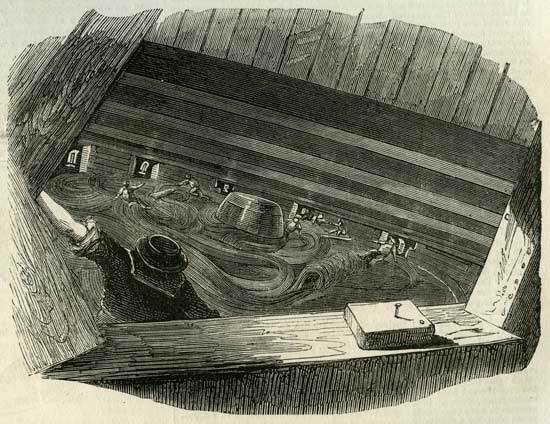 Much had been learned on the 1865 expedition about working with cable in deep water, and it was obvious from the many successes of the voyage that completing the laying of an Atlantic cable was within reach. With every expectation of a successful outcome, another expedition was mounted in 1866 using the Great Eastern with substantially the same crew, but with some modifications to the equipment based on the experiences of the previous year. The previous paying-out machinery on board the Great Eastern was altered to some extent by Messrs. Penn to the instructions of Messrs. Canning & Clifford. 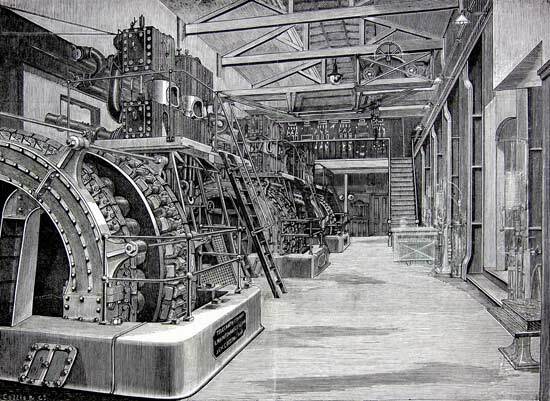 Though different in detail, the main improvement over the 1865 gear consisted in the fact that a 70-horse-power steam-engine was fitted to drive the two large drums in such a way that the paying-out machinery, as in 1858, could be used to pick up cable during the laying, if necessary, thereby avoiding the risk incurred by changing the cable from the stern to the bows. This addition of Penn trunk-engines, as well as the general strengthening of the entire machinery, was made in accordance with the designs of Mr. Henry Clifford. The 1866 expedition was a complete success; the laying of the new cable was uneventful, and the ship then set out to recover the lost cable of the year before. Extracts from Recovery of the Lost Cable—1866 by Henry Field. 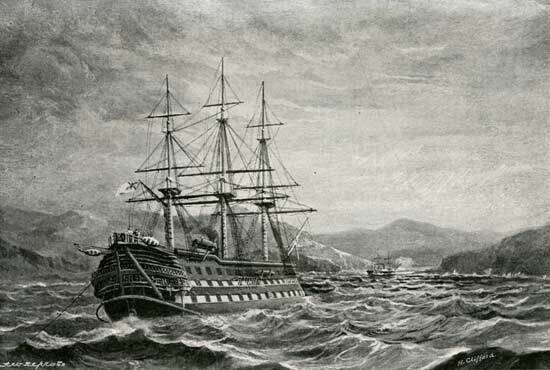 One of Henry Clifford’s favourite subjects was the Great Eastern. 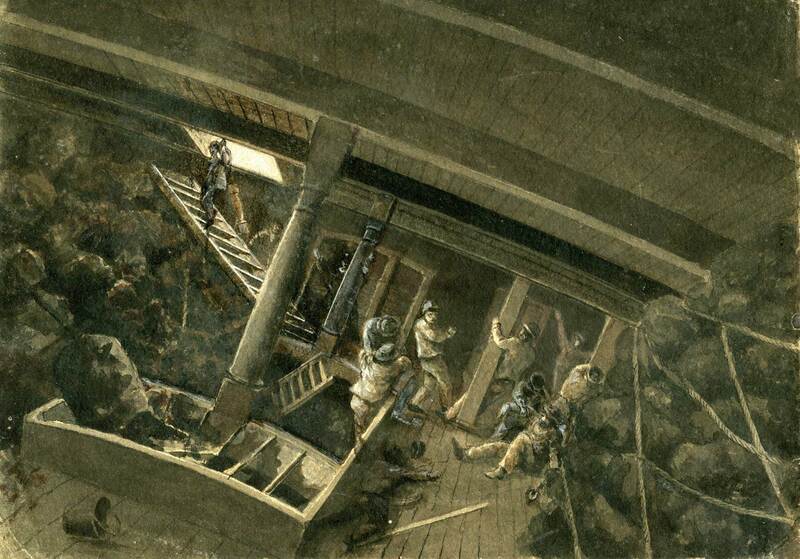 He painted many views of the ship engaged in the Atlantic cable expeditions, including a number of variations of the same scene. 7¼ x 10½ inches (184 x 267mm). It’s likely that Henry Clifford made sketches or preliminaries similar to the one above while on board ship, then painted the finished oils when he returned to England. 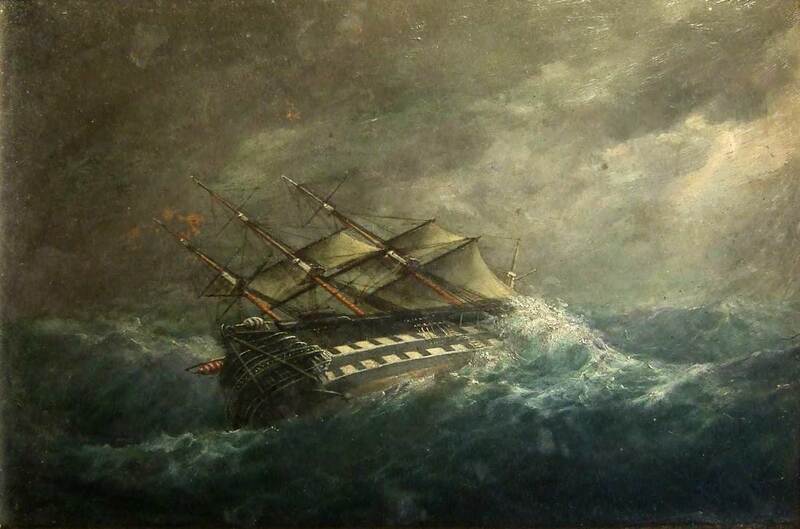 The National Maritime Museum at Greenwich has four oil paintings of the Great Eastern by Clifford, as well as several watercolours. 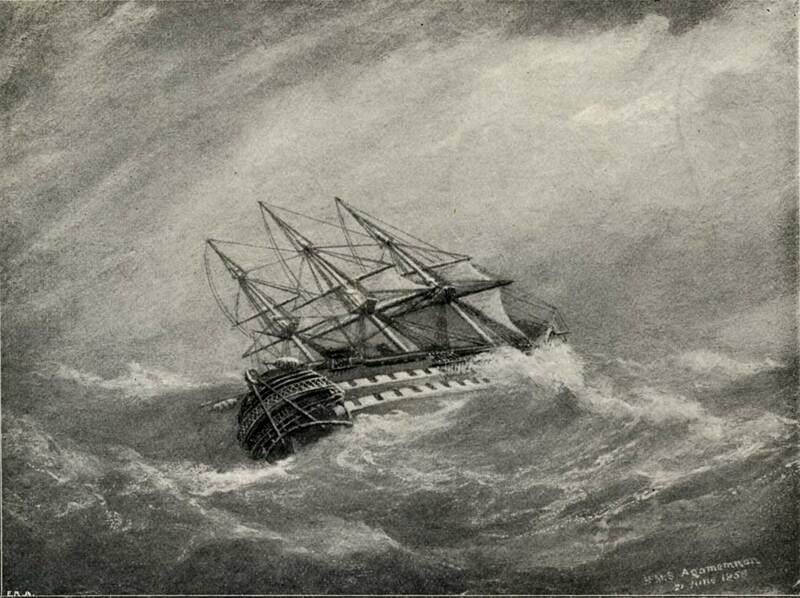 In 1867 the 1866 Atlantic cable had to be repaired, having broken just off the coast of Newfoundland. 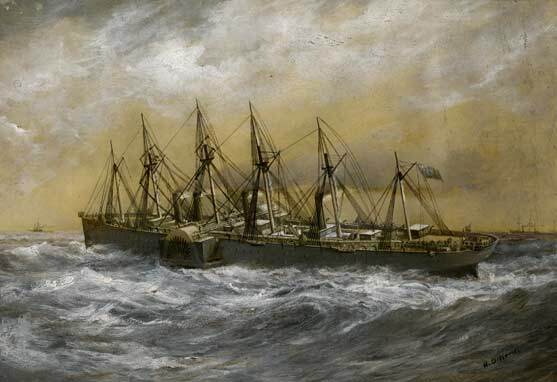 The events connected with the extension of telegraphic communication in 1866 were the most memorable ever recorded in its history; for in that year not only was a complete cable, uniting the Old World and the New, successfully submerged, but another, which was considered irretrievably lost by the general public, was recovered from the depths of the Atlantic. Some of the facts connected with its history and progress during he year 1867 are peculiar and interesting. The first prominent occurrence was the repairing of the Atlantic cable of 1866, which had been broken some two miles from the Bay of Heart’s Content. It appears that when the shore end of the cable referred to was being laid the Great Eastern, from which it was paid out, was in a fog, and it was laid in a shallower part of the ocean than was originally intended by the engineers. It was found that an iceberg, which had grounded in 27 fathoms, was the cause of the accident, and the cable was repaired in the marvellously short space of 48 hours, under the supervision of Mr. Henry Clifford, C.B. “Improvements in the manufacture of submarine telegraph cables.” The core of submarine cables is covered with powdered silica to preserve it from insects. The silica is preferably made to adhere to yarn previously steeped in pitch or other material, which is afterwards wound upon the core. Others in the industry proposed similar solutions, but Bright  notes that “it is believed that none of these ideas have ever been put into practice on anything like an extensive scale.” See below for Clifford’s work on the metal tape which was used from 1879 forward as the standard protection against borers. When about seventeen years of age Mr. Johnson became an articled pupil to Mr. W.F. Gooch, at the Vulcan Foundry in Lancashire, where he remained for five years. Failing, however, to find work that was congenial to his tastes, and after declining with considerable hesitation the offer of an appointment in a drawing office at the rate of £50 per annum, he resolved to join the applied sciences department, King’s College, London, for a year, and on the completion of this term he was engaged as a draughtsman by Mr. H. Clifford, the engineer of the Telegraph Construction and Maintenance Company’s works. It was here, in working out designs for improved cable machinery, under the immediate supervision of Mr. Clifford, that he obtained a clear insight into the most advanced form and construction of this important branch of engineering, and his keen observation had ample scope, not only in the direction to which his abilities so conspicuously tend, viz., in the design and construction of machinery, but also in the laying of all the original cables of the Eastern and Eastern Extension Telegraph systems. In 1878 Clifford again addressed the Teredo problem, for which his 1868 patent had described one solution. Bright 1898 p 381 ff. According to Mr Clifford’s plan, the metal tape is applied outside the core instead of outside the serving. It is this which is now in extensive use in the present day. Clifford’s brass taping was first applied by the Telegraph Construction Company to a part of the Eastern Extension Company’s Penang-Malacca cable laid in 1879. Since then it has been adopted for at any rate all the shallow-water sections of the Eastern, Eastern Extension, and Eastern and South African cables which are laid in at all tropical waters, where the teredo et hoc genus omne are liable to flourish, and where gutta-percha is the insulating medium. Charles Bright’s comprehensive article on marine borers and Clifford’s contributions to protecting against them may be read here. Clifford’s son William died of accidental gas poisoning in an incident at school in September 1873 when he was 14 years of age [The Times 26 Sep 1873]. Missing on this census is their son Harold Mills Clifford, born at Greenwich on February 9th 1867; perhaps at age 14 he was away at school. By now even more prosperous, Henry and Elizabeth had five servants: a governess, cook, housemaid, nurse, and parlourmaid. In 1888 Clifford was one of the mourners at the funeral of his old friend Sir Charles Bright, on May 7th of that year. Photograph dated 1890, showing Henry Clifford and colleagues at the Greenwich works of the Telegraph Construction and Maintenance Company. Henry Clifford is identified as “Father”, which suggests that the photograph may have been either taken or captioned by his eldest son Henry Charles. 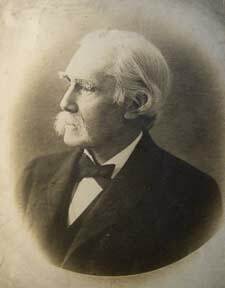 Henry Clifford in later life. In 1896 it was proposed to celebrate the upcoming jubilee of submarine telegraphy (in 1901) by a Memorial. The names of John Pender, James Anderson, and Cyrus Field were put forward as those to be honoured. This provoked a series of letters to The Times regarding the merits of these commercial men versus those of the scientists and engineers who made the cables work. Sir,—Lord Selborne’s address to the committee would lead any one to suppose that Sir James Anderson had laid the second Atlantic cable. This is an error. Sir Samuel Canning was the engineer in charge of the expedition; and upon him alone rested the responsibility of the undertaking. In point of fact the main feature of this expedition was the recovery of the 1865 cable. 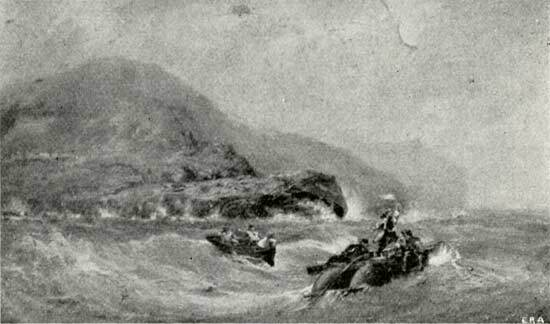 The possibility of laying a cable in deep water had been previously demonstrated by the late Sir Charles Tilston Bright in connexion with the first Atlantic line; but it remained for Sir S. Canning to prove that a cable could be picked up in the Atlantic, and to him alone all honour for this is due. A special application was made to the Admiralty for a navigator both as regards the first and second Atlantic cable expeditions; and in each instance Staff-Commander Moriarty, R.N., C.B., was deputed for the purpose, much to the credit of that Department. Sir James Anderson was the captain of the Great Eastern, but in no way responsible for the cable operations. With reference to the first Atlantic cable, Mr. Cyrus Field came over to England to raise the necessary capital; and, undoubtedly, much credit is due to him for his indomitable energy and perseverance. Sir John Pender acted in a similar capacity in the further extension of submarine telegraphs. But certainly all the three names pressed forward in the proposed memorial are those of commercial men rather than of engineering pioneers in this great engineering work. HENRY CLIFFORD, Assistant Engineer to Sir C.
It was later decided by the Committee in charge of the proposal to limit it to a memorial for Sir John Pender. The 1901 census shows Henry still at the same address in Lewisham, aged 79 and now “Telegraph Engineer. Elect App. Retired". His daughter Alice, now 30, is still at home, and there are three servants, a cook, parlourmaid, and housemaid. His son Henry Charles is now married and living in Hammersmith, occupation “Artist Sculp”, at which he had become quite successful. . Harold was married and living in Kensington with his wife and daughter; his sister Elsie was also with them. Henry Clifford died 18 May 1905 at his residence, 1 Lansdowne Place, Blackheath, Kent, at age 83.